For the ultimate dining experience on the waters of Lake Michigan and the Chicago River. As a rule, splurging on dinner should always be something of a sublime experience; add in a cruise, and you’ve just upped the ante – like, a lot. Cruising the glimmering waters, taking in the bright city lights, and, if you time it just right, watching a dramatic fireworks show, means you’ve pretty much guaranteed yourself the most memorable dinner possible. In Chicago, dinner cruises are something of a passion. Before telling you all about some city favorites, however, we&apos;ll tell you about the one dinner cruise that’s definitely the most anticipated. 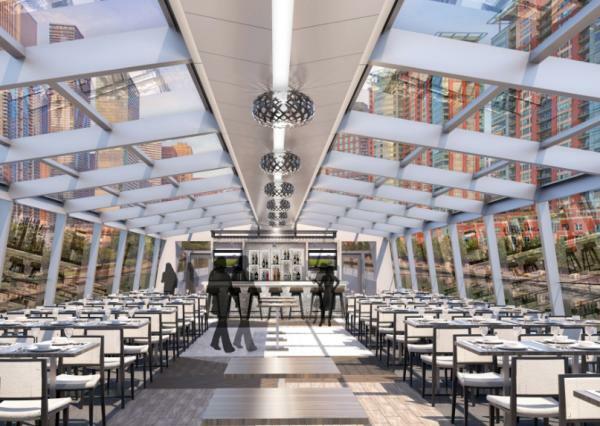 New vessel, new experience: Odyssey now offers an elegant and supremely unique experience on the Chicago River in the form of a state-of-the-art, European-styled, glass-enclosed vessel — think 360-degree city views! The new ship was designed specifically in response to growing demand for more out-of-the-ordinary experiences on the river. The idea is to showcase Chicago’s incredible architecture and mesmerizing vistas, and to create a refined environment in which to enjoy an upscale menu, with plated service. Curated live music adds to the refinement. The 140-foot, single-level vessel includes outdoor decks and a climate-controlled interior for year-round cruising. Docking space on the north side of the Chicago River lands you mere steps from Michigan Avenue and the Magnificent Mile. The atmosphere on Odyssey is magical. And thanks to climate-controlled decks, you can enjoy that magic year round. On this particular dinner cruise, not only do you benefit from a prix fixe menu, but a DJ is on hand to round out the evening’s entertainment. Not that watching the sun set over the silky waters of Lake Michigan and standing on the observation deck taking in the city skyline isn’t entertainment enough. If you can pull yourself away from those panoramic views, you’ll dive into a Wedge Salad of applewood smoked bacon, sun-dried tomatoes, chives and Italian parsley, followed by a choice of entrees: Oven Baked Atlantic Salmon Filet with lemon orzo and citrus dill sauce; Maple & Mustard Glazed Chicken Breast, with fingerling potatoes and chives; or Greek Zucchini Fritters, with lemon orzo and spring onion and cucumber tzatziki. Your three-course meal is polished off with Odyssey’s signature dessert station piled high with mini pastry cups, cakes, and seasonal fruit. Odyssey’s Prix Fixe Dinner Cruise boards at Navy Pier at 6.30 pm, with prices starting at $59.90 per person. For a truly upscale dining experience on the waters of Lake Michigan, opt for the 2-3 hour Odyssey Dinner Cruise, which offers a seasonally inspired three-course plated dinner with tempting dishes such as Smoked Moulard Duck Breast, Jumbo Lump Crab Cakes, and Filet Mignon & Lobster Tail. What’s more, while boarding, you’ll be entertained with light music to help inspire an utterly relaxed state of mind, and after dinner, Odyssey’s onboard DJ will turn up the tunes for a little dance fever. If you’re not in a dancing mood, you can kick back at Odyssey’s rooftop lounge and enjoy the panoramic views. Extras and upgrades are available, including cocktails, wine and beer from the cash bar and window table reservations for the best views. Here’s a tip: If you reserve on a Wednesday or Saturday from Memorial Day through Labor Day, your dinner cruise will be ornamented by Navy Pier’s Fireworks Show. Prices for Odyssey’s Dinner Cruises vary depending on the time of year and occasion. For example, Champagne Dinner Cruises are priced at $132.90, while Holiday Dinner Cruises are $99.90. Get more pricing information here. If you’re after more of a cool party atmosphere, then Mystic Blue is likely for you. A mouthwatering dinner buffet takes center stage on this 2-3 hour Lake Michigan excursion, which cruises past iconic Chicago sights such as the Shedd Aquarium, Soldier Field and the Willis Tower. Among the mounds of buffet bites are caprese salad, braised sirloin steak, pan-seared chicken, tilapia spring rolls, gemelli au gratin, brownie bites, cherry cheesecake, and…well, a whole lot more. A DJ and dance floor mean you can burn all those calories after you’re done gorging on deliciousness. Mystic Blue also offers cocktails, wine and beer at its cash bar, the option of a guaranteed table for your party size, window tables for the best views, and additional upgrades to customize your experience. Best of all, Mystic Blue’s cabins are climate controlled for year-round cruising. Prices start at $74.90. Mystic Blue also offers a fresh, fun, easy way to make the most of the city’s warmer seasons. Picture yourself lounging on Mystic’s rooftop deck, drink in hand, taking in the glimmering city skyline. Yeah, we thought you’d like that. From April through Labor Day, this 2-hour cruise on Lake Michigan features signature drinks for purchase, dinner, and a DJ and dance floor. Best of all, the Lakefront Breeze Dinner Lounge Cruise comes complete with interactive games like foosball, shuffleboard, and giant jenga. All in all, it’s a fun, engaging and exuberant way to share time with friends. Mystic Blue boards at Navy Pier, with prices for the Lake Breeze Dinner Lounge Cruise starting at $69.90. Spirit is the perfect dinner destination, whether you’re planning a bona-fide party or a romantic night out. Over the course of 2-1/2 hours, you’ll dine, dance and see the magnificent Chicago skyline from the enviable vantage point of Lake Michigan. The taste-bud-tingling buffet features freshly prepared entrees, salads and desserts, including Oven Baked Atlantic Cod Filet, Honey & Sesame Chicken, Whole Roasted Pork Loin, and Braised Beef Short Ribs. Spirit offers a guaranteed table and additional upgrades upon request. Cruises board from Navy Pier, with prices starting at $79.90. Here’s a tip: During Chicago Restaurant Week, you’ll enjoy the deeply discounted price of $33.92 per person – just one of the many deals featured during this citywide food-loving event. Like Mystic Blue, Spirit offers a Lakefront Breeze Dinner Cruise on select dates from May through September. 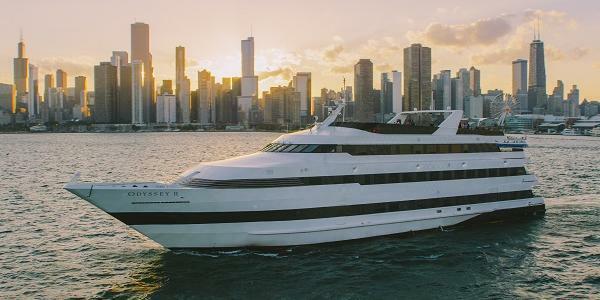 These 2-hour cruises on Lake Michigan feature a tasty menu, a private table offering the best views of the Chicago skyline, a DJ, dance floor, and interactive games. Prices start from $69.90 and board from Navy Pier.